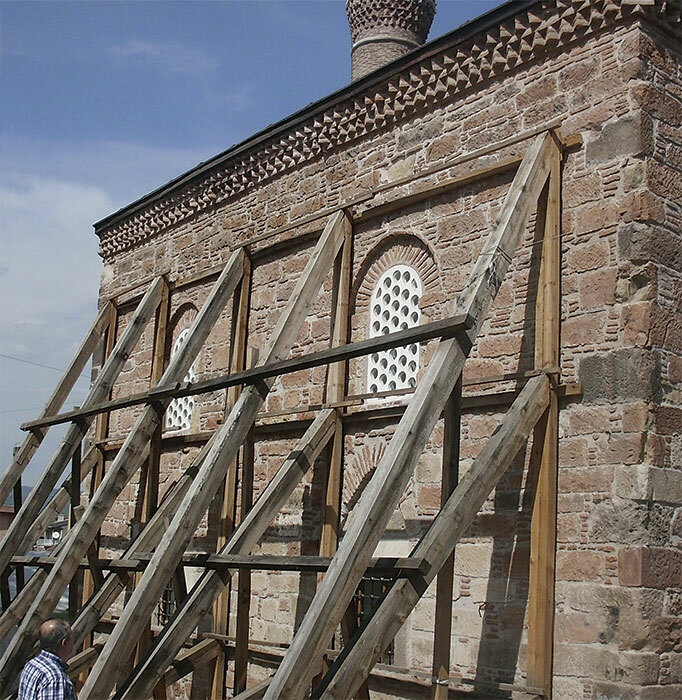 Emergency structural support for the Nasuh Ağa Camii (mosque) in Simav, Turkey, following a 2011 earthquake. Photo: Courtesy of the Republic of Turkey Ministry of Culture and Tourism, Cultural Assets Preservation, Regional Directorate Board of Kütahya. According to the Global Assessment Report on Disaster Risk Reduction 2015—prepared by the United Nations Office for Disaster Risk Reduction prior to the Third UN World Conference on Disaster Risk Reduction—2.9 billion people were affected and 1.2 million people lost their lives because of natural disasters occurring between 2000 and 2012. The report also stated that economic losses resulting from disasters now average about $250–300 billion per year. It estimated that an annual investment of $6 billion in disaster risk management strategies would reduce economic losses by $360 billion over the next fifteen years. A separate report prepared for the conference by ICOMOS ICORP (International Council on Monuments and Sites International Committee on Risk Preparedness) focused on the need for proper disaster risk management strategies for historic centers to preserve their heritage values. This document emphasized that historic centers constitute a major part of a city’s form and stressed the necessity of applying statutes and regulations to historic centers different from those used for modern structures when building disaster-resilient cities. Among natural disasters, earthquakes cause the most damage to, and loss of historic structures. After recent earthquakes in various geographic regions, legislators and government officials have often paved the way for demolition of historic buildings by applying legal articles they have created for emergency situations. For various reasons, including development pressures and lack of awareness, these officials may be unwilling to create legal frameworks to preserve historic buildings. However, as long as laws designed to protect historic buildings also give priority to user safety, it is possible both to mitigate seismic risks to historic buildings and to promote safety by developing and practicing appropriate risk management strategies. Although risk management strategies in different countries vary according to governmental structures, conservation policies, and the quality of the historical structures’ stock, there are some common policies for disaster risk management, including seismic risks, which are described below. Basic principles must be followed in creating statutes for managing disaster risks for historical structures; these statutes should be based on needs and updated dynamically to reflect changing circumstances. Preparation prior to a disaster, response during a disaster, and post-disaster rehabilitation should be addressed under separate legal codes, and strategic, tactical, and operational phases should be defined in legislative regulations. If it is unknown, it cannot be protected! An essential first step in managing disaster risk is preparing an inventory showing quantity, type, and present condition of historic structures. Properly selected and collected inventory data can help support the decision-making process in disaster risk management. To determine risk mitigation needs, risk assessment should be conducted to identify and evaluate primary and secondary disaster risks to historic structures, including inherent structural risks and those from the surrounding environment. And following a disaster, risk mapping should be prepared for heritage sites. Triage methods can help determine which structures require immediate intervention. Rehabilitation of historic structures—be it seismic retrofitting or post-quake reconstruction—should be carried out by qualified conservation experts. Project proposals should be reviewed by a single committee authorized and specialized to approve such work, and implementation should be overseen and monitored. Input from stakeholders, particularly occupants of historic buildings, should be solicited during preparation and implementation stages; all implementations should consider the needs of the occupants. The effectiveness of risk mitigation measures on historic structures can be tested only during actual earthquakes. The drills, tabletop exercises, and software simulations that model structural behavior of buildings during an earthquake produce only virtual results that may be close to what will actually happen. Any disaster management strategy should anticipate the unexpected, which may be conditioned by time and place, weather, secondary disasters triggered by the first event, and human panic. Research shows that much damage to historic buildings can occur in the response phase immediately following a disaster. Establishing policies for emergency management prior to a disaster; defining the scenario, actors, and their roles; and periodically testing these by real-time drills are necessary steps for proactively reducing damage and loss. Immediately after a disaster, authorized agencies arrive at the site and get to work. The first seventy-two hours are critical, especially with earthquakes. Rescuing survivors under the debris, demolishing structures that aren’t completely collapsed, and removing debris all occur within a few days. Thus it is crucial for historic structures, as well as for their occupants, that experts participate in the first hours of the response, beginning with the search and rescue stages. 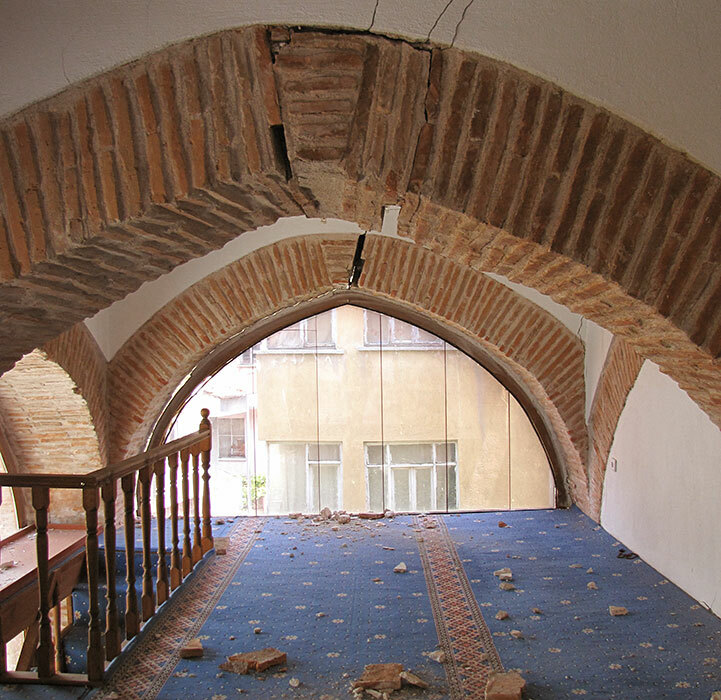 Interior view of the Nasuh Ağa Camii in Simav, several days after the 2011 earthquake. Photo: Zeynep Gül Ünal. Although many search and rescue teams are theoretically trained in different types of building construction, they generally practice on reinforced concrete construction ruin simulations. Therefore, when carrying out real operations in historic buildings, their lack of familiarity with traditional construction techniques puts both them and the victims at risk. During these operations, on-site advice from experts on historic construction techniques and earthquake behavior of the structures is crucial. Among other benefits, this information can be used to select appropriate equipment for undertaking search and rescue. In areas with high concentrations of historic buildings, guidelines prepared by experts explaining the traditional structures can be extremely helpful during early emergency response. Historic buildings damaged during earthquakes are sometimes partially or completely demolished to decrease risks during aftershocks. But initiating temporary emergency structural intervention can allow for protection of both the structure and the surrounding environment. Historic structures contain many different components, some of them highly significant, such as ornamental works or murals. Debris from damaged historic buildings should first be protected on-site, with the various components that can be preserved separated, inventoried, and transferred to secure locations for maintenance and repair, all before the remaining debris is removed. Moreover, historic structures where casualties have occurred are considered “crime scenes” in forensic terms. Therefore, investigation of the structure without changing or destroying the evidence, and gathering the necessary technical and scientific data by experts allows legal procedures to proceed properly and reliable data to be collected to enhance scientific understanding of the building’s performance during seismic activity. Experts doing this work should be prepared to arrive at disaster sites swiftly and to coordinate work with emergency response teams. Furthermore, beyond having specific training and the legal authorization to carry out such work, these experts should also be trained in the behavior of damaged historic buildings during aftershocks, in safe approaches to buildings and their surroundings after earthquakes, in temporary emergency support techniques for damaged historic buildings, and in documentation of damaged and undamaged areas. Training should include the preservation of evidence, personal safety, media relations and communications, and the psychology of working in extreme disaster situations. Such steps, along with the other policies outlined here, can do much to preserve the built cultural heritage that otherwise might be lost. Zeynep Gül Ünal is a professor in the Restoration Department of the Faculty of Architecture at Yildiz Technical University. She is a secretary general of the ICORP, ICOMOS Turkey, and chair of the ICORP Turkey.